We pride ourselves for introducing the first evolutionary Smartlipo MPX system from the USA into the UK and Europe in August 2008 by Dr Ayham Al-Ayoubi the leading Smartlipo trainer surgeon in the UK. Smartlipo MPX is the first dual-wavelengths laser system (this Smartlipo machine has two different lasers working at the same time) for laser body sculpting. 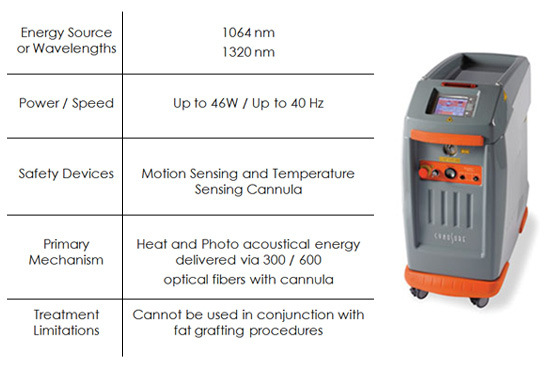 The novel Smartlipo MPX platform offers a solid state Nd:YAG laser capable of emitting laser radiation in two wavelengths: 1064 nm and 1320 nm. These versatile wavelengths can be used independently or can be blended using unique MultiplexTM (MPX) technology to offer a better laser assisted liposuction clinical outcome. As with the original Smartlipo workstation, Smart Lipo MPX is a minimally invasive laser lipolysis system. The system’s proprietary pulsing format delivers laser energy through a cannula to liquefy the fat, which is then removed from the body. The Smart Lipo laser energy also coagulates the tissue, thereby sculpting body contours and tightening the skin. The Smart Lipo laser liposuction procedure generally causes less bleeding, swelling and bruising than traditional liposuction, resulting in fewer complications and a more rapid recovery time. Dr Ayham Al-Ayoubi expalins that Smartlipo MPX is a global leader in Laser Assisted Body Contouring because it reduces liposuction treatment time with higher power and the clinical benefits of two wavelengths and it features SmartSense which is a intelligent delivery system for uniform energy delivery and added protection. 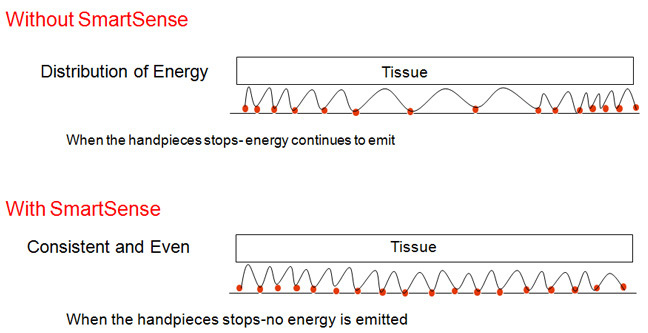 In multiplex mode, first the Smartlipo MPX laser fires the 1064-nm wavelength, and the energy is distributed homogenously into the fat tissue. 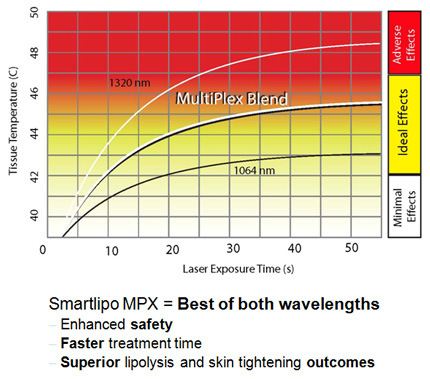 Then the Smartlipo MPX laser fires the 1320-nm wavelength, which has a strong absorption by the water. As the 1320-nm wavelength converts the hemoglobin to methemoglobin, it increases the energy absorption of the 1064-nm wavelength. Consequently, the surrounding small blood vessels coagulate immediately improving the hemostatic effect, as well as tightening the tissue in the treated area. In the Smartlipo MPX the1064 nm wavelength enhances hemostatic effect for less surgical trauma and faster recovery and the 1320 nm wavelength robustly absorbed by water resulting in high efficiency lipolysis and enhances tissue tightening through coagulation. Smartlipo MPX is equipped with a feature known as SmartSense. An intelligent delivery system that allows a precise distribution of energy that allows for safe, consistent patient outcomes. The SmartSense delivery system contains an advanced microchip called the Accelerometer, which is inserted into the intelligent handpiece. Based on the setting you choose (high, medium, or low) and the motion of the intelligent handpiece, the precise laser power is metered and delivered. Detects movement within the handpiece. Calculates laser energy to provide even distribution of energy according to the speed of movement. Smartlipo MPX is also equipped with a feature known as ThermaGuide which constantly measures the temperature under the skin and controls the output of energy, ensuring that the treatment area stays within a safe range so that it is hot enough to work efficiently, but not so hot as to cause the patient harm. SmartSense and ThermaGuide harnesses the full benefits of motion and thermal sensing technology for precise and controlled body contouring. Smartlipo MPX Laser Assisted Liposuction is ideal for small to medium size areas of fat deposits, broad tissue heating, reduced bleeding, bruising and areas of skin laxity.